The term “survival knife” has become quite a buzz word in recent years, and has unfortunately ended up in a lot of well-meaning consumers purchasing sub-par blades at inflated prices. Part of what we do here at Survivor’s Fortress is helping separate the “wheat from the chaff” when it comes to survival gear. This brings us to the Schrade SCHF9. Marketed as an “extreme survival knife,” this is a foot-long beast with a heavy, full tang blade – clearly designed this knife for serious business. While lacking in high-tech features or additions, the SCHF9 is intended to be reliable, durable, and friendly on the customer’s wallet. See below for our full Schrade SCHF9 Review. 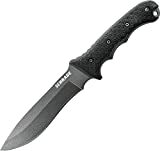 Overall, this is a full-tang, 1095 steel blade at an extremely affordable price. If treated well, this blade should perform beautifully for years with minimal sharpening. 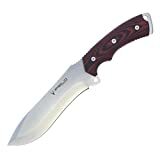 From everyday carry in the city to heavy use in the bush, this blade should be able to handle anything you throw at it and be very difficult to damage. Full-tang construction for a solid, reliable, blade that can handle a lot of punishment. 1095 has the potential to become brittle with age and is prone to rust if not pampered a bit. 1095 steel is extra high-carbon and will resist wear over time. The handle design can be a bit cumbersome for people with smaller hands or who aren’t using gloves. Excellent handle design provides a solid grip with or without gloves, wet or dry. Choosing a survival blade takes careful consideration. By definition, these are knives that you absolutely need to perform in a wide range of potentially dangerous or life-threatening situations. They are “problem solvers,” and in when survival problems arise, we expect them to deliver. Of course, what “survival” entails depends significantly on one’s location, background, and situation. This being the case, we also expect any knife claiming to be a survival blade to be incredibly versatile. It’s not unfair to expect a blade to hack through undergrowth all day and still be sharp enough to provide self-defense if whatever’s on the other side isn’t friendly. Blade Size – small blades will be no good for chopping, but larger blades may be too cumbersome for more detailed slicing. Size matters – and everyone’s situation may call for a different blade length. Geography – in a survival situation, geography plays a huge part. In urban settings, self-defense may be a primary goal, while more rural areas may call for an “outdoorsman’s” knife that can handle hunting, camping, and fishing as well. Blade Metal – each type of steel will have its pros and cons. Does it rust easily? Is it strong enough to handle heavy-duty use in the deep woods? Does it hold an edge, or will you be sharpening every night? EDC or Not – most blade owners would balk at the idea of carrying a 14” blade around on their hip every day, but to an avid outdoorsman, having something big and heavy on hand is practically essential. You have to consider how – and how often – you want to carry before deciding on a knife. The Schrade SCHF9, at 12.1” and boasting a 6.4” blade, is designed to be a highly-versatile knife that can fill a lot of different roles, performing admirably in all. Its blade is neither too large or too small, and is thick enough and hearty enough to handle heavy cutting and chopping, but small enough to slice and whittle if needed. The blade point is also rather blunt, making this knife great for piercing without worrying about chipping the tip. The blade itself is 1095 High Carbon “tool steel,” which will hold an edge longer and be generally tougher than other materials, though it will need some care to avoid rust. As for EDC, the SCHF9 does come with a ballistic belt sheath, which makes it rather easy and safe to carry. This is a heavy-duty, versatile blade that can handle chopping, cutting, and slicing jobs with little problem. It’s a fantastic price for 1095 steel, but you’ll need to pay extra attention to it to make sure it doesn’t rust. As mentioned, the Schrade SCHF9 packs a sturdy 6.4” blade made of 1095 steel, and while it certainly wasn’t designed to win any beauty contests, we have to admit that it is quite a beautiful fit on this knife. Deciding how well it functions in the field, however, requires a much closer look. The manufacturer bills the blade as having a “kukri point,” which is yet another hint that this knife may have been “machete inspired.” Of course, as kukri machetes have a dramatic curve, this blade would only represent the part of the machete closest to the tip. Looking at it this way, the shape is more obvious, but the recurve on the cutting edge is much less dramatic than most machetes of this type. Overall, this blade is thick and mean – designed for chopping – and with an excellent blunt tip that’s ideally suited to piercing most materials. The full-tang construction backed up by the full ¼ inch thickness gives me quite a bit of confidence that this blade will perform in tough situations, while the generous finger choil should give you the control you want to handle more delicate tasks as well. We’ve already gone into quite a bit of detail about the 1095 steel used in this blade. Known as “tool steel” in knife circles, this type of steel is quite high in carbon, which is perfectly suited to a survival knife as it will hold an edge longer than stainless steel and take a significant beating without chipping or bending. Keep in mind, however, that 1095 is a bit more prone to rust than other steels, and if not tempered correctly can become brittle over time. While the latter is on the manufacturer, keeping the blade dry, storing it outside of its sheath, and oiling the edge from time to time is a great way to keep it rust free and doing its job. At nearly 1 lb and 1 foot long, the SCHF9 is a hefty knife, and it comes with a hefty handle – perhaps too hefty according to some customers. The manufacturer claims the 5.9-inch handle is designed to conform to many grips, from standard to choking up on the choil to a chopping grip at the end of the handle. Even so, some users find it a bit cumbersome to use with just one hand, with a few claiming the “giant” finger grooves can fit two of their fingers. More or less, this sort of “larger than life” handle design is to be expected of a versatile blade that is most likely going to be used with gloves, but it’s worth noting nonetheless. What users do agree on, however, is that the TPE (thermoplastic elastomer) coated Kryton handle offers a fantastic grip, mimicking the best qualities of plastic and rubber. This grip is further supported by a secure front quillion, thumb jimping, and a generous finger choil. All things considered, the SCHF9’s handle will satisfy most users, as a solid grip is and “no-slip” design attributes are the first thing most guys will look for in a heavy-duty knife like this. The SCH9’s included sheath is a bit of a standout for a knife at this price point, as most blades under $50 often toss in the cheapest piece of knife-shaped fabric they can just to keep the customer quiet. Made of heavy ballistic nylon, this sheath is nothing to write home about, but is more than enough to protect the blade. For a little extra durability, the portion that actually holds the knife is made of molded plastic and fits the blade quite securely. It isn’t custom-fitted, tight, but it’s tight enough. For those who want multiple carry options, the sheath also has lots of adjustable velcro attachments, which are perfect for the belt and leg. Unfortunately, the “shoestring” quality rope that wraps around the leg leaves a little bit to be desired, but it can be easily replaced with something stronger. There is also a pouch for a small item, such as a whetstone or other sharpening tool, which can be snapped on or off. Overall, the sheath offers quick and effective access to the blade and can be easily secured to your pack or your person. The SCHF9 is clearly a knife that means business, and its laundry list of features – from the TPE coated handle to the extra thick, full-tang blade design – seem to aim to please outdoorsmen, survivalists, hunters, and campers alike. On top of that, however, the SCHF9 is pretty enough to be a collector’s item, but durable enough to spend hours hacking at wood without concern for its appearance at the end of the day. Well-balanced for its size and weight. Where most large blades tend to store much of their weight in the handle, causing rapid exhaustion in the user, the SCHF9 is perfectly center-weighted, allowing for powerful strikes that won’t tire the striker. Great for batoning wood or chiseling. The SCHF9’s blade shape and thickness lend it to batoning lumber, and its full-tang design helps ensure the safety of whoever is doing the hammering. Enough finesse to feather sticks. “Feathering” wood has become the go-to measure of a blade’s ability to perform delicate work. According to many users, a well-sharpened SCHF9 is more than up to this, and other, precision tasks. Handle design absorbs shock. The full tang of the blade is sandwiched by two kryton handle halves, which are bolted solidly to each other thanks to several recessed Allen bolts. When striking an object, these handles help absorb much of the shock, protecting the blade. There are alternatives to the Schrade SCHF9 if you want to check out other options. Here is a look at some of the best ones. The TOPS Brakimo fixed blade is a major contender for the Schrade SCHF9 in all categories except price. In most places, the Brakimo will come in at more than double the cost, perhaps even triple. Still, that extra money does give you access to a pretty amazing and reliable survival knife. With a 5.25” full tang 1095 Carbon Steel blade, the Brakimo starts off in a dead heat with our SCHF9, but when you look at the overall length, which is 2” less, it becomes clear that the handle is much shorter. As this was a major criticism of the SCHF9, this could be a plus for some users, but it will completely eliminate the chances of using a two-handed grip. All in all, this is a versatile survival blade for those in the wilderness willingly or not. Reliable, sturdy Kydex sheath with plastic belt clip and swivel design. Extremely heavy at nearly 1 lb. Full tang design with 1095 carbon steel and a modified Scandi grind blade. Handle is Micarta and canvas for a solid grip in all conditions. Includes an extra large lanyard for bushcraft like making arrows. The iField 150 Fixed Blade offers up some serious competition for the Schrade, though it does cost a good 60% more. Boasting a 7” blade and a weight of over 1 lb, this knife is designed to handle all the hardest parts of camping and hunting, which makes it a great survival knife for anyone who can lift it. This larger, heavier knife also forgoes 1095 for 440C blade steel, which is an extremely tough and durable metal that has a natural corrosion and rust resistance and takes a fine mirror finish that lasts a long time. Like the SCHF9, the iField 150 is full tang and comes with a nice leather sheath that adjusts for multi-position carry. This is a serious knife fit for survival and self-defense in the bush or just another day out camping. Black leather sheath works for multi-position carry. 440C steel is high-carbon and very tough, as well as corrosion resistant. Massive 7” long blade is impressive, but not cumbersome. Full tang construction for extra durability. The Gerber Prodigy Tanto Survival Knife rings up at roughly the same price as the SCHF9 but has a myriad of features the latter blade does not. Made of 420 HC (high-carbon) steel, and boasting a serrated tanto point, the Prodigy is a more tactical knife designed for use in many different situations, from EDC to camping to hunting to self-defense. Unlike the SCHF9, the blade of the Prodigy only measures 4.7” long, and its overall length of 9.75” makes it a much more practical EDC knife, though some may argue this (along with a weight of only 7.2 oz) limits its use as a chopping blade. For those who want a reliable knife that won’t weigh them down, this is a good consideration. Versatile canvas sheath allows for multiple carry methods. TacHide grip for a secure hold whether wet or dry. Tanto blade designed for piercing, serrated edge designed for quick sawing. Lightweight design with a 4.75” blade. Durable, high-carbon 420 HC steel with black oxide finish. Considering all the information, it’s clear that the Schrade SCHF9 is a rugged, “no apologies” survival knife. It is big, heavy, and meant to take a beating in the woods, on the street, or in your own backyard. Sure, there are alternatives – good ones – but this is a great chance to get your hands on a 1095 steel blade at a fantastic price point. Bear Grylls Survival Knife Review: It's Worth your Money? Conrad Novak is a proud father of two children. His journey as a prepper began when Hurricane Katrina hit and he lost his job due to the 2008 economic crisis. That made him realize that everything can change for the worst in a very short time. This experience was the detonator for him to pursue learning and becoming better prepared to face the kind of unexpected disasters that may occur at any point in our lives. As the editor of Survivor’s Fortress, he is committed to providing with the most accurate and up-to-date tips and information to help you become more self-reliant and keep you prepared for whatever life throws at you.